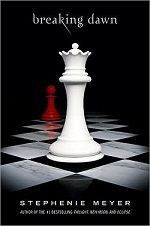 Breaking Dawn is the fourth novel in the Twilight series by Stephenie Meyer. Divided into three parts, the first and third sections are written from Bella Swan's perspective and the second is written from the perspective of Jacob Black. Breaking Dawn was released on August 2, 2008 at midnight release parties in over 4,000 bookstores throughout the US. From its initial print run of 3.7 million copies, 1.3 million were sold in the first 24 hours of the book's release, setting a record in first-day sales performance for the Hachette Book Group USA.